Three persons have been whisking away at the polling unit at Adewale street, unit 17 Alekuwodo. The affected persons, a woman and two middle aged men were allegedly in possession of. Agents of some political parties have raised their voices in the unit. However, security intervened to bring the matter under control. 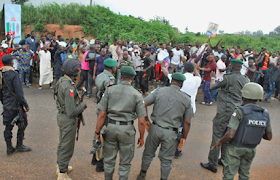 Similarly, voters across Oruu community in Disu Oke-Odo area, Ward 7, Kajola road to Thursday were allegedly stopped by people suspected to be political thugs. The thugs were sporadically in a bid to scare and prevent voters from reaching their polling units.